After learning that Apple's iPhone 5s was being activated by carriers at a far higher rate than the less-expensive iPhone 5c, we were curious as to how the UK compared to the US when it came to that breakdown – so we asked Localytics, the company that provided the original activation stats this Monday. 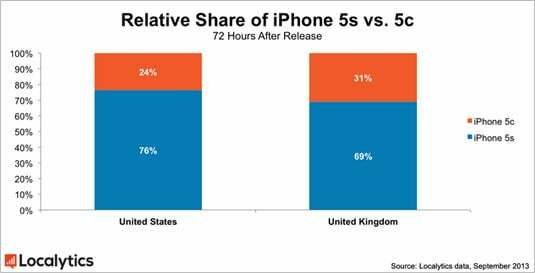 "Comparing the United States with the UK in regards to their preferences of the iPhone 5s and 5c shows some interesting results," Localytics VP of marketing Bernd Leger told The Reg in an email. "The UK has a significantly lower share of people preferring the 5s versus the United States; as a matter of fact the UK actually had the lowest rate of all of the countries we analyzed." Exactly why that's the case is, of course, open to speculation – and Leger was happy to provide his own. "With the economy in the UK still in recovery, a slightly less strong affinity for the 5s could be the result of a more cost-conscious buyer," he opined. "Subsidies also play less of a role in the UK's phone market than in the US, making the upfront cost of phones higher for consumers." While Localytics' Monday figures covered carrier activations only through 8pm Eastern Standard Time on Sunday, the updated figures that Leger provided us extended for a full three days after the iPhone 5s and 5c went on sale last Friday morning in the US. 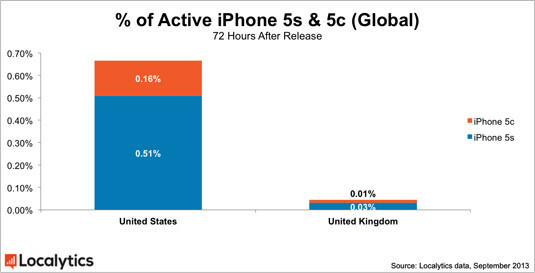 The UK's overall activation of the iPhone 5s and 5c is miniscule when compared to that of the US. "The UK is seeing a 0.04 per cent share of all active iPhones worldwide after 72 hours of launch versus a 0.67 per cent global share for the US," Leger said. Interestingly, in a separate email a Localytics spokeswoman said that in the three days after the launch of both handsets, China had the lowest percentage of iPhone 5c activations of any country surveyed, with 9 per cent of the activations in that country being of the 5c and the remainder being the pricier – and blingier – iPhone 5s.